EMOJI Mini Beach Balls - A cool prize for poolside parties, carnivals, and beach bashes. This collection of beach balls features a variety of emoticon prints. If you're throwing a luau or beach theme party, hand these beach balls out as fun party favors that are sure to keep the party going. ARE YOU HOSTING A BEACH PARTY or Hawaiian luau, these mini EMOJI inflatable beach balls are a must-have for your event! These mini vinyl beach balls are fun for kids and adults alike. Their small size makes them ideal additions to goody bags and great prizes for beach party games. You can also use them to create unique centerpieces at your next barbecue. SPLASH & TOSS these MINI EMOJI BEACH BALLS around the yard! Keep them handy for in-the-summer-sun fun and you'll have a Bright time all season. PERFECT PARTY FAVORS for a sunny Birthday party. These Emoji Beach balls are ideal for a Cool pool party celebration! 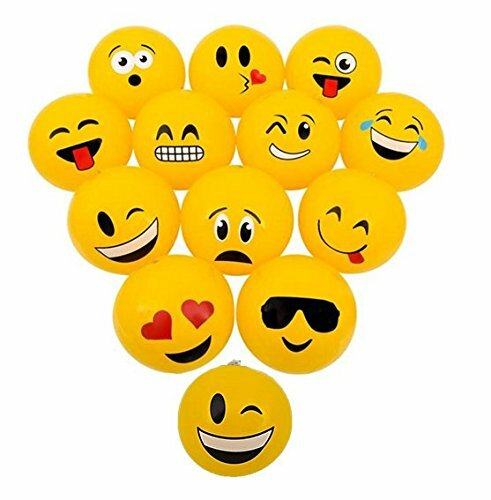 UPDATE YOUR POOL TOYS with these cool fashionable mini EMOJI BEACH BAllS The perfect addition to your spring and summer toys, these Mini Spring Brights Beach Balls are great to use in the pool, out of the pool, indoors or out.